Mr Nakamura wanted to invest his lump sum wisely, so he listened to the experts, he understood that equities went up and down but that, over the longer term, losses were usually recovered. He invested in an actively managed equity fund, which wasn’t too expensive and over the following quarter of a century his fund manager did well, out-performing the index, returning a loss of only circa 30% versus the total return of -36.12% from the Nikkei Index (29/12/89 to 5/12/2017). To us, Japan cuts through some of the noise around costs, underlying charges and the ongoing active versus passive debate. As Amin Rajan put it, “beating a benchmark is a hollow victory, if investors cannot meet their financial goals”. One mistake Mr Nakamura made was not to consider starting valuations and prospective returns and we fear similar mistakes are being repeated today. As a real return house, we seek to beat inflation-plus benchmarks which have, to date, always risen and require a minimum target return to be achieved such as; Consumer Price Inflation (CPI) +4%pa net of our costs. Consequently, we need to understand if a portfolio of assets has enough potential to achieve the return targets. 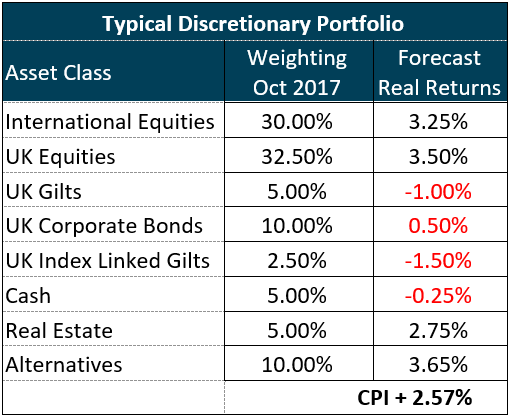 To avoid any bias, we have used the MSCI WMA Balanced index to represent the typical discretionary fund manager and overlaid the total return forecasts from the excellent 22nd Long Term Capital Assumptions by J.P. Morgan which we have adjusted for the Bank of England's inflation target of 2%pa. We have used an equally weighted basket of Macro Hedge Funds (Hedged), Global Infrastructure and Private Equity to get the expected returns of alternatives. So what are the prospects for a typical portfolio? If J.P. Morgan are right, the above basket of assets has the potential to return ~Inflation (CPI)+2.57%pa or 4.57%pa, if the Bank of England are successful in keeping UK inflation at 2%pa., before any fees. We can’t help feeling that lowering the costs of the portfolio and/or marginally outperforming the index will not make a meaningful difference to the end investor. The issue is that this basket of assets was created in, and for, a different age as 22.5% of the assets offer negative returns after fees (highlighted in red). As inflation-plus benchmarks cannot be bought, or tracked, we operate within a risk budget linked to the client. This means that we are not restricted to ‘tilting’ around, or are even constrained by, a fixed list of assets chosen many years ago. This means we can consider a broader range of investments and new “off-benchmark” sources of returns. Therefore, it shouldn’t be any surprise that we have chosen to replace as much of the value destroying assets in red with exposure drawn from alternatives, whilst, remaining within the client’s risk budget. What has surprised us is that most advisers/investors are focusing on the slightly higher charges for the portfolio (~8-10bps) and have completely ignored the far larger uplift in prospective returns. For Mr Nakamura, a cheaper passive wouldn’t have made much difference but choosing a market with better prospective returns would have, even if it did come at a slightly higher cost.